Autumn is a transition time: after summer’s exuberance, nature starts a transformation of a very material character: trees get naked, stones look clean of summer dust thanks to the rains, dragged by the river. Rocks and mineral are protagonists around us. In order to visualize this transformation nothing is better than the sculpture. That’s why, at Ca l’Antiga we have invited this autumn a sculptor who is in love with El Maresme to the point he moved here to work and create artwork with marble, alabaster, coil, wood. He also intends to pass his passion as sculptor and as art amateur. You will be able to enjoy his work admiring magnificent alabaster and coil pieces that are just part of his work which embrace more aspects and materials. This exhibition would be an introduction to his art full of light, transparency, warmth, splendid shapes and meticulous work. The material essence comes to the surface and takes shape. We have programmed performances where he will show us how he works the different materials. There will be music and more entertainment. And this all in Teià’s Major Feast frame. 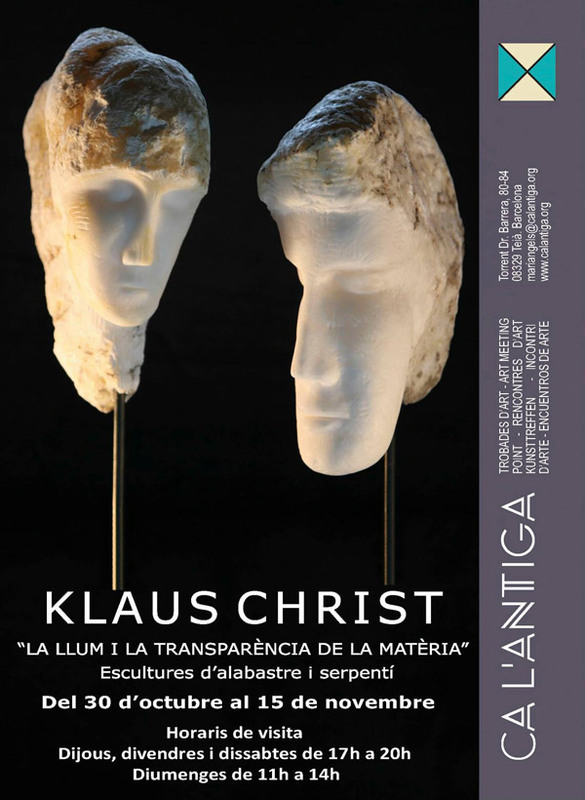 Klaus Christ loves stones and lets them to guide him in order to find the intimate shapes, the transparencies; after all, the spirit of the chosen Stone. If wood, he doesn’t mind, he likes to sculpt both pieces and full trees, dead but still standing. His work has a lot of aspects but in this exhibition he offers us his alabaster and coil work. We would find – Strength and Finesse – Opacity and Transparency – Shapes and Spirituality.